Industrial valves have multiple applications such as broiler startups, in steam conditioning, in the recirculation of feed pumps as well as in turbine bypasses. The power industry along with industries such as medicine, oil, energy, and supply chain are actively utilizing industrial valves for proper control, regulation and vigilance on the flow of materials (usually, liquids and gases). Valves are employed in industries which primarily operate with chemicals and affluents. Most popularly, valves are used in the condensate system to control and regulate the additional flow which is required for proper fluid recirculation in the pump. Further, valves are also used to control the levels of the deaerator which impacts the feedwater heater. The supply of fluids in the power industry, for instance, uses industrial valves for controlling the recirculation in the boiler feed pump. There, they have a crucial role to play as valves are operated in the on-off modulation. Mainstream industrial valves are used as turbine bypass, superheaters, and superheater bypass, etc. As per experts, an increase in the number of nuclear plants industry in the developing and developed regions of the world is giving rise to new reactors being installed which are actively making use of cooling and catalytic agents which use sophisticated use of industrial valves. Large hydro and thermal power generation is directly impacting the production and manufacturing of industrial valves. 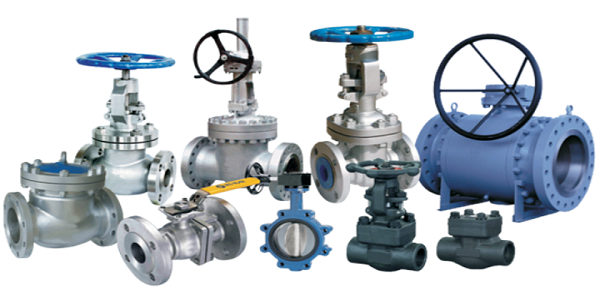 Ball valves, gate valves, and butterfly valves are categorically employed for various different functions in the power industries. Valves in the energy sector verticals are used in processes such as chemical treatments, cooling water, in-stream turbine control systems and in feed water purposes. Industrial valves are dependent on the power sector which is expected to grow at a high rate. This will significantly contribute to the expansion of the global industrial valves market. The energy sector is expanding due to an increase in the energy demand from the APAC countries because of high population, increased urbanization and modernization in the region. Conventionally, the end-user industries use the type of equipment and operations which employ difficult and demanding conditions for operating, because of which an equally tough and functionally efficient variety of valves are demanded. Tougher, and better performing valves with long shelf-life are being preferred in the oil and gas industries. The second phase of the industrial revolution which is taking shape of futuristic technologies employing valves in a more efficient and robust way. Various industries are operating on lower costs of production and longer pipelines stretched in large areas. The use of structurally complex drillers and refiners make manufacturers prefer employing sturdy and multi-purpose valves which have a low cost of installation and convenient repair options. As the production and processing of industrial valves become more advanced, their functioning is becoming more efficient and cost-effective. Performance expectations from valves in newer industries are higher with the security and protection of the personnel being added to the list. Industrial valves which ensure safe, secure, and efficient control of materials is the new trend. In spite of market restraining factors such as the high cost of the customization and repair of industrial valves paired with a slowdown in the oil and gas industries, the valves are being manufactured and supplied worldwide with a high-profit margin.